With experience built on handling the most challenging and multi-dimensional shipments on behalf of the world’s loading Project consultants, EPC Contractors & international Freight Forwarders for some of the most prestigious projects in Iraq and the wider Middle East region, our Project Cargo division has developed the expertise to offer solutions & execute movements for any kind of equipment, be it by land, air or sea. 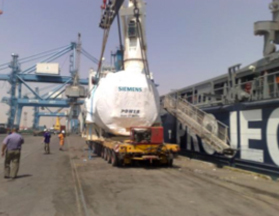 At Sharaf Shipping, along With our network of reliable partners, understand the pulse of Project cargo handling activities like planning. Route selection, packaging, handling, haulage, storage and delivery. We operate in wide variety of sectors which have project logistics needs, including oil & gas, automotive, construction, & power & energy. Our focus is always on safety, running very strict procedures on any project move.